Following the market opening Monday, the Dow traded down 1.42 percent to 24,387.24 while the NASDAQ declined 1.43 percent to 7,062.29. The S&P also fell, dropping 1.15 percent to 2,634.19. Monday morning, the utilities shares slipped by just 0.2 percent. Meanwhile, top gainers in the sector included Azure Power Global Ltd (NYSE: AZRE) up 16 percent, and Companhia de Saneamento Básico do Estado de São Paulo (NYSE: SBS) up 1 percent. 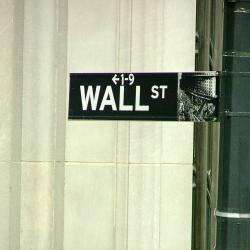 In trading on Monday, information technology shares fell 1.9 percent. Caterpillar Inc. (NYSE: CAT) reported weaker-than-expected earnings for its fourth quarter on Monday. Caterpillar reported a bottom line of $2.55 against $2.99 estimates, with revenue of $14.3 billion falling shy of $14.33 forecasts. Caterpillar projects EPS of $11.75 to $12.75 for the 2019 fiscal year. Consensus anticipates just $12.64. Trevena, Inc. (NASDAQ: TRVN) shares got a boost, shooting up 46 percent to $0.79 after the company announced a pathway to resolve concerns the FDA had with oliceridine. Shares of Avalon GloboCare Corp. (NASDAQ: AVCO) shot up 46 percent to $6.19 after the company announced development of a saliva-based biomarker for oral cancer. Comstock Mining Inc. (NYSE: LODE) shares were also up, gaining 27 percent to $0.1775 after the company entered an agreement to sell its Lucerne Properties for $15 million. Dynagas LNG Partners LP (NYSE: DLNG) shares dropped 35 percent to $2.63 after the company cut its quarterly dividend from $0.25 per share to $0.0625 per share. The stock was also downgraded by B. Riley from Buy to Neutral with its price target cut from $10.50 to $2.65. Shares of Vale S.A. (NYSE: VALE) were down 17 percent to $11.27 after the company announced plans to suspend dividends, buybacks and bonuses following Brazil Dam disaster. NVIDIA Corporation (NASDAQ: NVDA) was down, falling around 15 percent to $136.46 after the company lowered its Q4 sales and gross margin guidance. In commodity news, oil traded down 2.03 percent to $52.60 while gold traded up 0.05 percent to $1,304.80. Silver traded down 0.12 percent Monday to $15.68, while copper fell 0.97 percent to $2.7025. European shares were lower today. The eurozone’s STOXX 600 slipped 0.68 percent, the Spanish Ibex Index declined 0.96 percent, while Italy’s FTSE MIB Index dropped 0.64 percent. Meanwhile the German DAX dropped 0.46 percent, and the French CAC 40 slipped 0.65 percent while U.K. shares fell 0.56 percent. The Chicago Fed National Activity Index rose to a reading of +0.27 in December, compared to +0.21 in November. The Dallas Fed manufacturing index for January will be released at 10:30 a.m. ET. The Treasury is set to auction 6-month bills and 2-year notes at 11:30 a.m. ET. The Treasury will auction 3-month bills and 5-year notes at 1:00 p.m. ET.